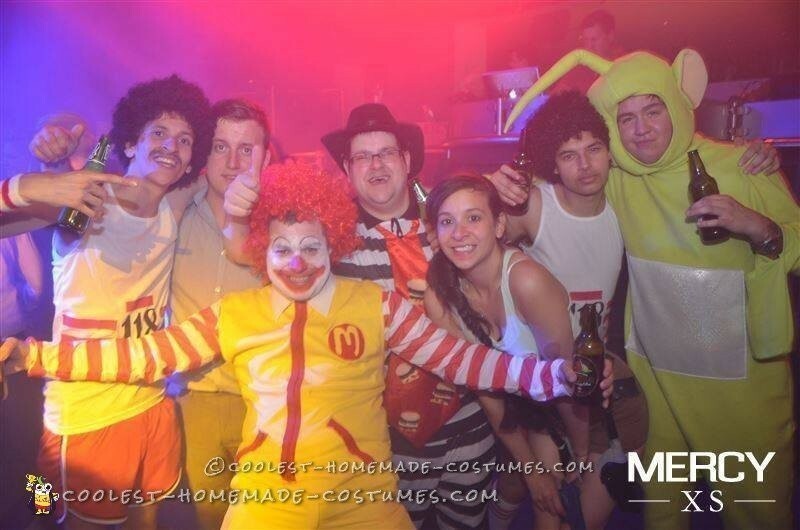 I made these Ronald McDonald and Hamburglar costumes for my boyfriend and his friend, as we were all going on a night out. 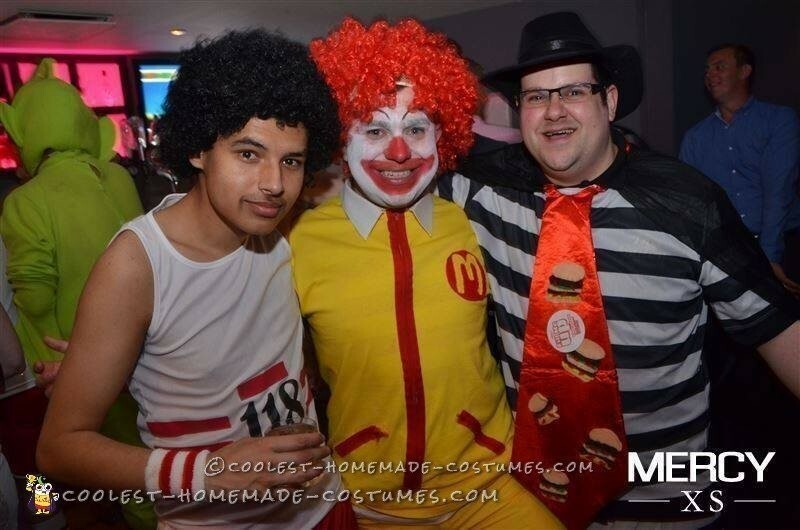 Everyone on the night out all worked at McDonalds including these two. We kept their costumes as a surprise. Everyone found it hilarious and quite ironic how they dressed up. When we were out they received lots attention from people wanting photos, we even went in KFC which everyone found amusing. 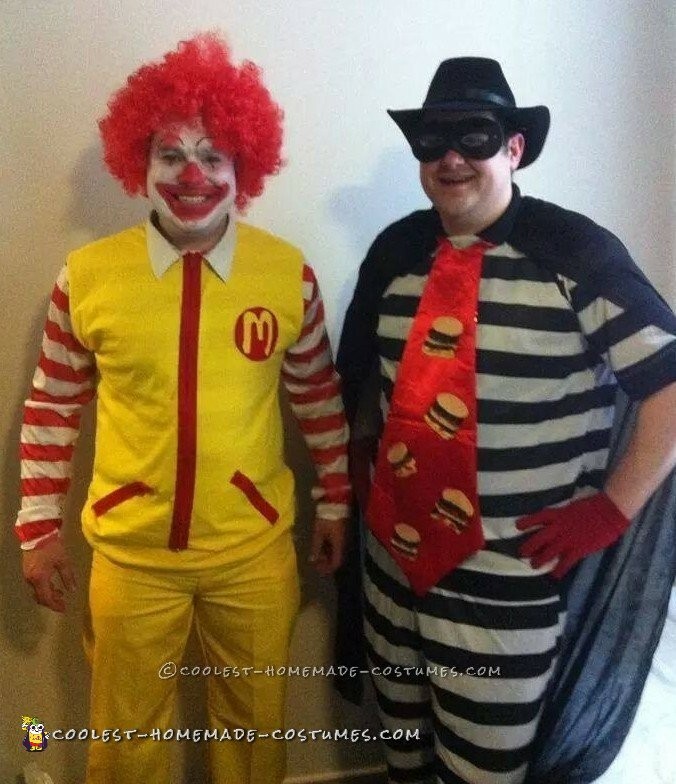 The costumes themselves were not hard to make; the Hamburglar was pretty simple. I brought a prion outfil and the accessories such as; hat,mask gloves and cape. However, I had to make the tie which probably took the longest to do from both costumes. I used felt to make the burgers which was very fiddly to sew together. The Ronald outfit also wasn’t too hard to make. The yellow trousers were the hardest thing to find. For the costume I brought a yellow t shirt and cut the sleeves off. I also bought a red and white stripped top which was worn under the yellow t-shirt. On the t-shirt, I cut a collar from a white shirt which I sewed on to the collar of the t shirt. I brought some zips which were functioning as I made pockets using the sleeves from the t-shirt. I cut the logo out of felt. the trousers were just cut to 3/4 lengths and he wore some red and white stripy long socks. However, by the end of the night the Hamburglar’s costume didn’t make it as he got very drunk and was sick all over himself. Not really a good way to end the night. I also woke up with a red face as I was allergic to my boyfriends face paint and had been kissing him all night. However, overall it was a brilliant night out and I was very happy with how the costumes turned out and every bodies reactions to them.